BentoLunch.net - What's for lunch at our house: Faith's Egg Experiment Lunch. You just can't make shaped eggs and not feed them to the kids. ;o) So Faith got one for her Friday lunch. 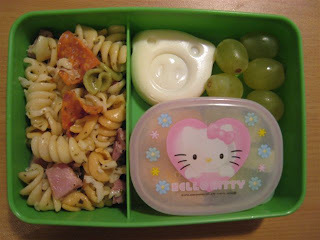 She took pasta salad, mixed melons (in the HK container), some grapes and half a pig shaped boiled egg. The lunch box came home empty, must have been a hit.